Throughout the years, I have written much about Modern humans (mostly postdiluvian humans), but I have not delved into humans living before the global floods of 13,000 years ago. This is not an accident. The veil that shrouds antediluvian humans is thick with dust and aged by the long passage of time, and I, as a proud member of Taobabe group, am rather lazy to get my fingers into the dusty, musty bones of ancient times. To address my grievous oversight, I am going to delve right into the thick of things. Of the three types of antediluvian humans, I’m going to zero in on the least understood, and most mysterious of the humans, the Denisovans. We truly do not know much about them other than the few tiny bone scraps of individuals that we have managed to identify through small bits of their ancient bones. Of the documented texts about them, there is next to nothing. Nothing that is directly tied to them, that is. But the inferences…those abound. I wrote a tiny thought about the Denisovans back in 2010, when we first discovered the existence of an entirely new species of humans that, heretofore, hadn’t even been included into our history. I didn’t go into very much detail because at that time, there wasn’t much to go on. In fact, fast forward seven years later, and to this day, the only Denisovan remains discovered so far (or at least, as far as we are allowed to know about) are a finger bone, a bone needle, a toe bone, and three teeth. Denisovans, also known scientifically as Homo sapiens ssp. Denisova and Homo sp. Altai (ssp. and sp. stands for sub-subspecies and subspecies, respectively). This designation is apt, seeing that Denisovans are, in fact, humans, with the tell-tale human-specific chromosome 2 that all humans possess. Experts have long insisted that it is difficult to say exactly how this homo species looked like, but in reality, Denisovan DNA is the only DNA that is as extensively mapped as the human DNA, and that’s saying a lot considering that not even the Neanderthals got that much DNA sequencing. Given that we have a high-coverage genome sequencing of a member of the Denisovans , my argument is that we can figure out what they looked like physiologically if we just tried, using some basic assumptions. In fact, the genetic data we have on the Denisovans are of a similar quality as that of modern day humans. Not even the Neanderthals have been this well sequenced. Look, I don’t pretend to be a geneticist or an archaeologist and I don’t have the necessary skills or knowledge to sequence genes or to decipher glyphs or cuneiforms, but I can do a basic visual comparison based upon what little information we have been given, and I can certainly speculate and make some derivations based upon what we have so far. I took the Denisovan tooth, with its given size  and placed a human tooth next to it. Then I scaled both to their relative sizes to get a good comparison of the differences between the two. The difference is astounding. It was here that my natural instinctive curiosity was roused and I had to try and figure out just how large the difference was. Since the people who first found the molar thought it belonged to a cave bear, I dug around until I found size comparisons between cave bears and humans. To fit that tooth into a humanoid jaw, the jawbone would have to be 1/3 times larger than the normal male jawbone. That means that an average man, who is 6-feet tall would be 1/3 smaller in size than a Denisovan male. But that wasn’t enough to satisfy my curiosity. I knew that Melanesians and Papua New Guineans had the most amount of Denisovan genes in their genetic makeup, so I went looking for ancient skulls from this area. Surprisingly, there is one skull type that is present, even in today’s humans. It is categorized by anthropologists as otamid, which describes a skull with an elongated shape to the back of the head, a strong square jaw, sloping forehead and pronounced brow bone. Otamid skulls are usually those that are considered archaic, with those robust features you would find on the Erectus and the Australopithecus. These features don’t show up in Modern Humans, but in certain groups of humans, most notably the aboriginals of Australia and the islands thereabout, otamid skulls can still be found. Many aboriginals of Australia and Pacific Islanders have this different skull shape, which is different than the skulls of those who are of European descent. Since the aboriginals have the highest amount of Denisovan DNA, in addition to their Neanderthal DNA, I figured the Denisovans would also have a similar skull shape to the aboriginals of Australia. Based upon this supposition, I took the skull of an ancient aboriginal from Australia , enlarged it according to the brain volumes given for each human species, and then placed it next to the Modern and the Neanderthal, and this is the size and shape difference we are talking about. To us, the Denisovans would be giants. 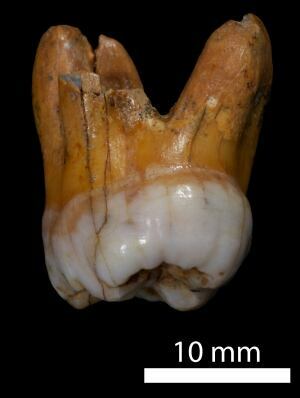 Their giant size is also corroborated with a tiny nub of finger bone which bore similar Denisovan DNA from the two molars found in the same cave. The kicker is, that finger bone was unusually broad and robust–well outside what is seen in modern people, and yet, genetic analysis of that finger bone revealed that it belonged to a little girl with dark skin, brown hair, and brown eyes. As young and undeveloped as her body was, it was still larger than the average man on the street, and she lived somewhere in southeast Asia at least 30.000 years ago. So, based upon the genetic information that we have managed to scrounge up thus far, I am going to go on a limb and make a few tiny assertions. The Denisovans were giants with dark skin, brown hair, and brown eyes. They suddenly emerged between 300,000 and 250,000 years ago, from hominids with 48-chromosomes, and due to a sequential change event, evolved quickly into the 46-chromosome humans. They are the same nephilim race mentioned in many ancient scriptures. These are not tiny assertions, but bear up with me and I’ll move this discussion into those areas with my next few posts.